Your invisible removable aligner treatment consists of a series of nearly invisible, removable aligners. Each aligner is manufactured so that it is personalized to your teeth. A virtual 3D treatment plan will be done to show the series of movements your teeth will go through over the course of the treatment. No. Unlike traditional wires and brackets, you can eat whatever you like while in treatment because you remove your aligners to eat and drink. Thus, there is no need to restrict consuming any of your favourite foods and snacks. Also, it is important that you brush and floss your teeth after each meal and prior to re-inserting your aligners to maintain proper hygiene. Smoking is discouraged while wearing aligners because it is possible for the aligners to become stained / discoloured. Chewing gum while wearing aligners is not advised as gum can stick to aligners. It is recommended that aligners be removed for all meals and snacks. Is the Invisible removable aligner treatment painful? How long does the Invisible removable aligner treatment take? The duration of treatment depends on the complexity of the treatment and is generally equal to that of traditional braces. Typically treatment can last between 9 and 18 months, or longer. During your consultation, our dentists can provide you with more detailed information. Appointment intervals are generally the same as with traditional braces but can be much quicker with less time spent in the dentist’s chair during appointments as no adjustments need to be made to wires/brackets. Patients typically visit their dental provider every 4 to 6 weeks to ensure the treatment is progressing as planned, and to receive their next few sets of Invisalign aligners, but your dentist or orthodontist will decide based on your treatment. How much does Invisible removable aligner cost? As with other types of orthodontic treatment, the cost of Invisible removable aligner is dependent on the complexity of your case and your course of treatment – but the cost is generally comparable to traditional braces. Please feel free to ask our dentists if your have any enquiries. During the initial consultation, our dentist will discuss the issues you have with your teeth and explore what kind of results you’re hoping to achieve. If the corresponding treatment is suitable for you, a treatment plan will be mapped out with your goals in mind. Our dentist will take impressions of your teeth and will send these to the laboratories for processing. The impressions of your teeth will be digitized in order for our dentist to review a computerized 3D image of your teeth. Our dentist will prescribe and review the precise tooth movements throughout the duration of your personal treatment plan. You’ll be able to see a virtual representation of your teeth before, during, and after the treatment, so you can see what your smile is expected to look like once you’ve finished the treatment. Once you and our dentist have agreed to the treatment plan, bespoke aligners are then custom-made for you and have to be worn for approximately two weeks before you switch to the next aligner in the series. 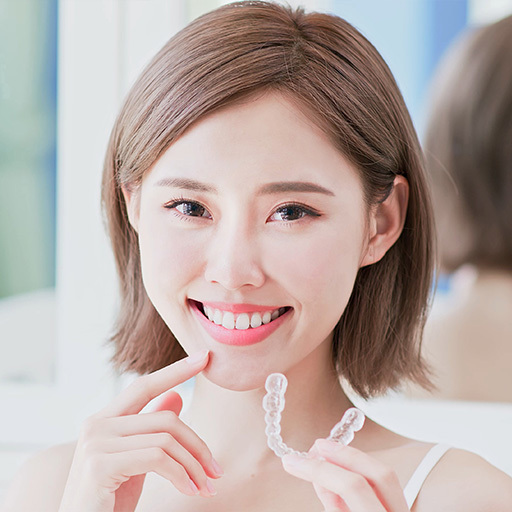 While the number of aligners varies for each individual, a full treatment typically includes 18-36 aligners for both the upper and lower teeth, which will take approximately 9-18 months, or more, depending on your individual case. Aligners should be worn day and night, except when eating, brushing or flossing teeth in order to complete your treatment in the timeline determined by you and our dentist. You’ll go in for checkups every 4-6 weeks to monitor your progress and to receive your next series of aligners. During the entire treatment process, you’ll notice small movements, and your teeth will gradually move into an even and healthy smile. This allows your dentist or orthodontist to fully assess and inspect every aspect of your condition, and accurately plan out the stages of your treatment.